Is your home getting dirty? Algae starting to consume your homes exterior? Don’t put off getting your house washed professionally and don’t waste time trying to do it yourself when you can enjoy your weekends and hire the pros! Whether you’re just needing your yearly house washing service or need a thorough house washing to help sell your home by improving your homes curb appeal, we have you covered! When it comes to hiring a company to pressure wash your home, make sure they’re also licensed and insured. We are fully licensed, insured and trained. Hot Power Wash at up to 260 degrees hot water. It cleans better and kills mold and algae. We hand scrub the exterior of the gutters to help remove black streaks. We hand scrub all exterior windows window frames and sills. It leaves the glass and windows cleaner than just power washing. We spray on a Hot sealer wax to seal shine and protect your home. Give us a call today for your FREE ESTIMATE. We have been providing house washing services in the Milford and surrounding areas for over 20 years. When you call onto Hall’s We Clean Service, you know you’re calling the pro’s! 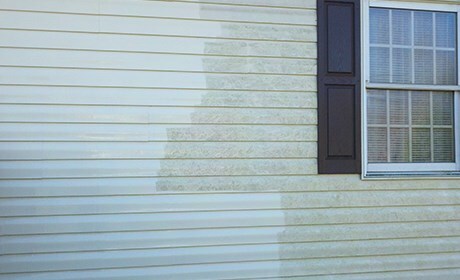 Let our highly trained and knowledgeable team give your home that much needed makeover it deserves. Call today to see why we’re the areas top professional house washing service.